Matt A. Myers is a life long resident of Wilson, NY. 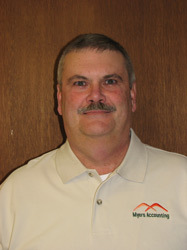 Matt established Myers Accounting Service, Inc. as result of his education. Matt is a 1976 graduate of the State University of New York College at Fredonia with Bachelors degrees in both Accounting and Business Administration. Currently Matt is the President of both Myers Accounting Services, Inc. and Canalside Financial Inc. located in Lockport, NY. Matt has been providing accounting and financial services for over 30 years. He is also a registered representative and investment Advisor representative of Commonwealth Financial Network, member FINRA/SIPC, a registered investment advisor. Matt serves as Chairman of the Board at Exley United Methodist Church in Wilson, NY. He is also Chairman of the endowment fund at the church. Matt has been involved in the Wilson community for many years. Matt is a volunteer fireman with the Wilson Volunteer Fire Department, where he has served numerous office positions ranging from Chief, President and currently Vice President. Matt is a member of Niagara County Volunteer Fireman's Association and is Past President of the Niagara County Chief's Association. Matt is also on the Planning Board for the Town of Wilson. In his free time Matt can be found out on the golf course, vacationing, and enjoying both Buffalo Sabres and Buffalo Bills games. Matt currently resides in the Village of Wilson with his wife Susan. Matt has three children, Matthew, Amanda, and Patricia. All Content is Copyright © Myers Accounting Service, Inc.